Dedicating our February issue to the great Liberal, Gopal Krishna Gokhale on his 150th death anniversary and featuring him on our cover elicited much appreciation from our readers. 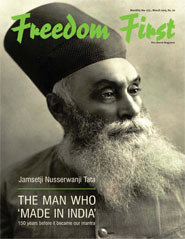 In this issue, we feature on our cover another great Indian, Jamsetji Nusserwanji Tata and congratulate the Government of India in honouring him by releasing coins of Rs.100 and Rs.5 commemorating his 175th birth anniversary. We were very critical of the manner in which Arvind Kejriwal accepted Indira Congress support after the last elections a year ago to the Delhi Assembly and rushed to form a government even though his AAP party did not have a majority. He was quick to realise his mistake and gave up office in less than 50 days. We congratulate him on regrouping and leading his Party to a fantastic victory decimating, in the process, the Indira Congress and pulverising the BJP. As is our wont, we shall refrain from being judgemental on his government’s performance for the next six months. This of course will not prevent our contributors from commenting on issues relating to policies of his government from a liberal perspective.